The Marine Mammal Center : Fear the Beard! "The Beard" is an elephant seal patient we rescued with a tar patch around his jawline that looked suspiciously like the beard famed San Francisco Giants relief pitcher Brian Wilson sports! The Beard returns back to the ocean at Point Lobos, CA. Home free! The Beard along with some of his other hospital buddies, went back to the ocean today at Point Lobos in Monterey County. Elephant seal "The Beard" has a small patch of tar around his face and neck. "The Beard" is eating fish on his own just a week after he arrived at our hospital in malnourished condition! Nicknamed after the famous San Francisco Giants player, Brian Wilson, "The Beard" is really a young male elephant seal weaner that our volunteers rescued on a beach in Capitola, Santa Cruz County, on April 16. The 82 lb pinniped was suffering from malnourishment and was lethargic - a big indicator for our team that this animal needed help, fast. In addition, "The Beard" somehow got covered with tar patches on his face and neck, forming what appears to be a thick beard. Fortunately, those patches are small and over time he will molt his coat and the patches will fall off without the need of a shave! While he was too weak to eat on his own upon arrival at the hospital, volunteers and medical staff attended to "The Beard" daily, tube feeding him until he got strong enough to participate in fish school. "The Beard' out-shined many of our other seal patients during fish school (which typically lasts a week or more) and actually finished the semester of learning how to properly swallow a fish in just one day! 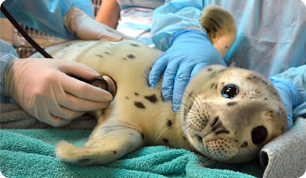 Now, he's eating almost 3 lb of fish a day, and soon, veterinarians will increase that amount so he can get bigger and strong enough to return to the ocean. Human - Brian Wilson - "The Beard"
Pinniped - Northern Elephant Seal - "The Beard"
Status: Receiving medical care - expected to return to the ocean by June! Buy some meals for "The Beard" and our seal patients - Dollar-a-Pound!